From the Hancock County Courthouse, take Hwy 22 southwest for 7.2 miles to Devereux. Turn right (at the backward fork) onto Main Street. Go 0.2 mile to the dead end and turn left onto Jones Chapel Rd. Go west on Jones Chapel Rd for 4.9 miles to Carr's Station Road. Turn right on Carr's Station Road and go for approximately 8.6 miles to Lake Sinclair Drive. Turn right onto Lake Sinclair Drive and go for approximately 4.7 miles to Big Water East. Turn left onto Big Water East and go for approximately 1.7 miles to a fork in the road. Take the road to the right (which is still Big Water East) for approximately 1.4 miles. 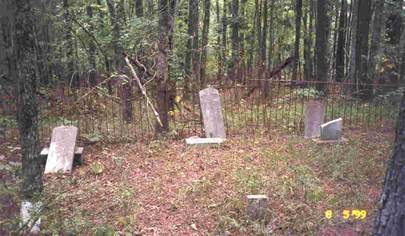 The cemetery is on the right (northwest) side of the road, not too far off the road (75 feet) with an iron fence around it. You cannot see the cemetery from the road. At the time of the survey, there was a slightly overgrown "driveway" or opening in the woods about the width of a car at the cemetery, with a tree across this opening. On the opposite side of the road from the cemetery the land had been clear cut. "Father" "His memory is blessed." b. Virginia, d. Baldwin County, Ga., per Jann J. Rice, descendant. "Doles" and "Butts" per Jann J. Rice. b. Baldwin County, Ga, d. Baldwin County, Ga per Jann J. Rice, descendant. d/o W. S. and Martha Jackson. "She is not dead." Actual gravestone reads "Lizzie R. Jackson" b. 1888, but date is in error, per J. Rice. b. Hancock Co., Ga, d. Hancock Co. Ga. s/o W. S. and Martha Jackson. Birth and death locations per Jann J. Rice.